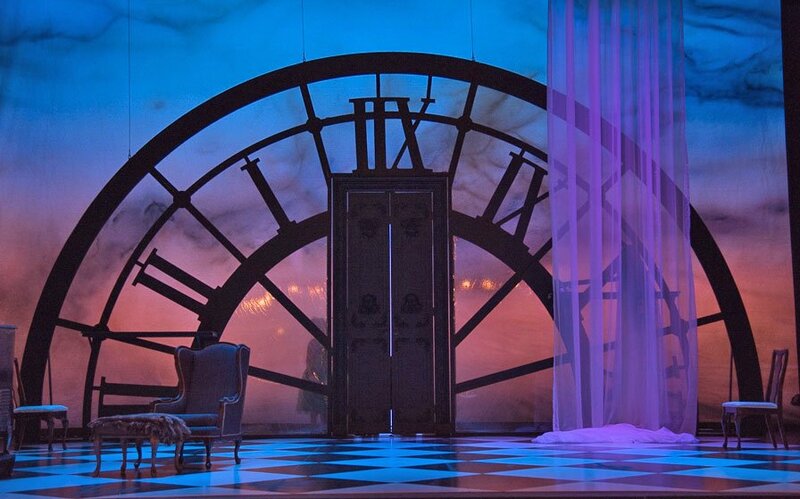 Boston can now [also revived by BU in 2015] enjoy a vivid example of Massenet’s charm in the New England Conservatory’s production of Cendrillon, first produced in 1899, at the height of Massenet’s career. This comic adaptation by Henri Cain of Perrault’s Cinderella story, with subtle additions from the Sleeping Beauty legend, makes for a well-paced evening that sparkles with droll humor, fairy dust, and, above all, effortlessly clever and often lovely music. The NEC production is double-cast with graduate singers in the voice program. There was a cautionary announcement at the beginning by Joshua Major, stage director, that Sooyeon Kang, soprano in the title role and substituting for an ailing Erica Petrocelli, was herself vocally under-the-weather and wouldn’t be singing in full voice; but we wouldn’t have known this from the performance, because Kang gave us a vocally rich and well-acted Cendrillon. Her stage opposite, Prince Charming, is a Hosenrolle in this opera, and Margaret Bridge, soprano, shares equal honors for fine singing and able characterization. 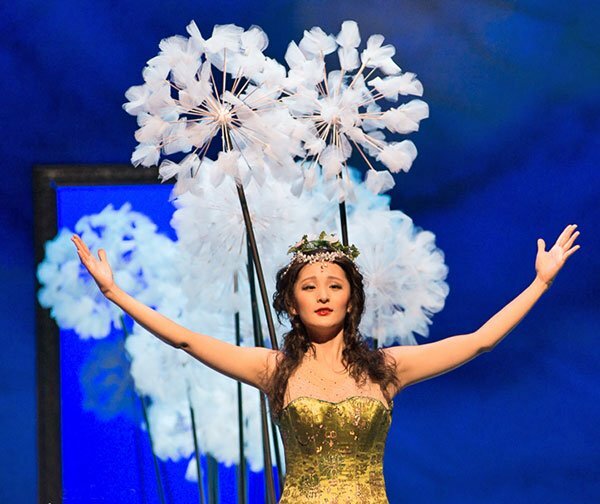 The Fairy Godmother/Queen, a coloratura role, was fearlessly handled by Helen Zhibing Huang; her music even offered a backward glance at the Bell Song (with glockenspiel) from Delibes’s Lakmé, composed 15 years earlier. The evil stepmother, Madame de la Haltière (Brindley McWhorter), and her grabby daughters, Dorothée (Morgan Middleton) and Noémi (Chang Liu), all executed their roles with professional nastiness and good sound. The dramatic weakness of the opera, namely that Pandolfe’s is the only important male role, was amply compensated by Josh Quinn’s outstanding performance. I had not been in the Cutler Majestic since the Boston Lyric Opera did Beatrice et Benedict some years back, and it was gratifying to realize once more that the jewelbox theater is well proportioned to give a good sense of intimacy with a relatively large stage space. With a cast of this size, and only a dozen servants and courtiers, there was ample room for moving around effectively. The set for the domestic and ballroom scenes was dominated by a semicircular clockface at the rear, to emphasize the midnight cutoff, while the chorus of fairies in Act III brought in their own forest of white feathers on six-foot sticks; these were ranged as a line down the center of the stage, so that Cendrillon and Prince Charming could speak to each other across them in their dream sequence. 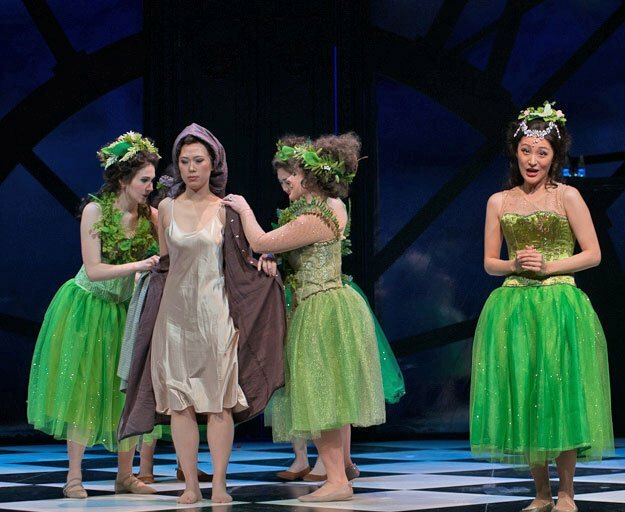 Costumes were well ordered, from Cendrillon’s plain gray house uniform (magically transformed into a bright white ball gown) to the bright green fluffy foliage of the fairies. The orchestra is small-full, with paired woodwinds (including two piccolos), normal brass, and strings 8-6-4-3-2. Hugh Wolff conducted the whole ensemble ably and comfortably, and even took part in some of the byplay. From where I was seated, I could watch him in a prompter’s television screen, not far from where the translations were projected. score, but an inspired stroke of staging. Another episode of comic genius in Act III results when Pandolfe, the exasperated paterfamilias, shouts “Le diable vous emporte!” at his wife and stepdaughters, and they shriek in diminished-seventh dismay. But a moment of telling poignancy in Act I, during Cendrillon’s solitary rumination, is addressed to the cricket on the hearth, “Reste au foyer, petit grillon,” in 6/8 A minor, like Schubert’s Gretchen at her spinning wheel. This music returns with beautiful effect in Act III, after Cendrillon returns alone from the ball. Elsewhere, one can find dominant-seventh chords moving in chromatic-scale succession; this is also one of Debussy’s trademarks, but Fauré and Chabrier took advantage of them too, in a distinctively Gallic manner. In Cendrillon one can especially admire Massenet for his amiable smoothness of dramatic thought. The music is confident, and appropriate to the task, and contains a popular touch that is neither pretentious nor excessively sentimental — qualities that I often find lacking in the best Italian opera and even more in German opera. Think of this opera as a romantic tribute on St. Valentine’s Day, and bring your friends. Repeats tonight and tomorrow. I went to the very enjoyable performance on Monday night. I wonder if Mr. DeVoto could comment on Massenet’s decision to cast a soprano as Prince Charming. Was it simply a fashionable thing to do at that time? To my ears, a tenor would have worked better by providing a contrast in pitch and timbre, and using a male lead also would have made more sense dramatically. I’m no expert on trouser roles, but there are a number that are well known: Cherubino, Octavian, Prince Orlovsky, who else? I’m not thinking of children’s roles like Hansel or the Tsarevich. The Prince is a trouser role for soprano falcon (French voice type a bit darker and lower than regular soprano) “of the right size,” and the same composer also cast women in male roles for Jean in his Jongleur de Notre Dame and for the title role of his opera Chérubin. The original singer for the Prince was Marie-Louise van Émelen, and the original singer for Chérubin was Mary Garden. It was a common approach in fairy tale operas of the time (maybe sounded more childlike and family friendly?). Leonore in Fidelio is a special case, so I wouldn’t call hers actually a trouser role. The audience is aware almost from the beginning that Leonore is a woman disguised as a young man, even if the characters on stage don’t know this until the opera is almost over (poor Marzelline is the last one to find out: “Oh, weh mir, weh mir, was vernimmt mein Ohr!”). In the traditional trouser role such as in Figaro and Rosenkavalier the audience is supposed to accept that Cherubino and Octavian are actually young men.